There is no shortage of cases for the iPhone, but this is certainly an original thought. 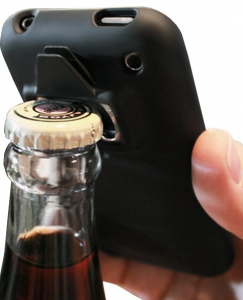 The iPhone Bottle and Can Opener Case for iPhone 4 and IPhone 3GS. It has a built in stainless steel bottle opener and can tab that is made of a hard-shell ABS plastic. I think this one is a hard sell… the website’s copy defines it as “less than 1 inch thick,” which is a great thickness if you’re trying to protect a laptop, but I’d think twice about it for my iPhone. They also throw in a bonus iPhone App that keeps track of your popped tops and opened cans and plays monkey screams, or whatever your heart desires to hear when you open your beer. The case also comes in hot pink for the lush-ous ladies out there that don’t want to break a nail while opening a can. A completely unbiased [rolls eyes] review on iTunes (the only one) describes this app as “sooo much fun” with “super cool functionality.” But I downloaded it to check it out… I can’t imagine running this app every time I want to open a beer.